Dolphins are some of the most playful and intelligent animals on our planet. 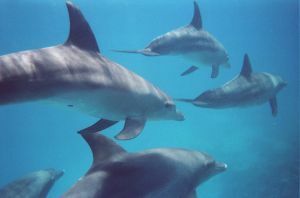 Even though dolphins spend their lives in the water, they are not fish, but are mammals. Dolphins can't breathe water like fish, but need to come to the surface to breath air. There are many kinds of dolphins. Perhaps the most famous are the Bottlenose Dolphin and the Killer Whale (that's right the Orca, or Killer Whale, is a member of the dolphin family). Dolphins are very social animals. Many dolphins travel in groups called pods. Some dolphins, like Killer Whales, live in pods of 5-30 members for their entire lives. Each pod behaves differently. Some pods migrate and travel around the world, while others have a specific territory. Sometimes pods can group together to make giant pods as large as 1000 or more dolphins. Baby dolphins are called calves. The males are called bulls and the females are called cows. The largest dolphin is the Killer Whale which grows up to 23 feet long and can weight over 4 tons. The smallest dolphin is the Heaviside's Dolphin which grows to just over 3 feet long and weighs around 90 pounds. Dolphins have long snouts that typically hold around 100 teeth. 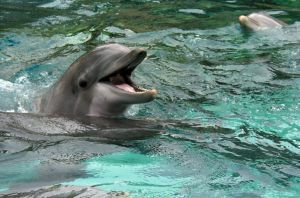 They also have a blowhole on the top of their head that they use for breathing. For the most part, dolphins eat other smaller fish, but they are not limited to just fish. They eat squid, too, and some dolphins, like Killer Whales, will often eat small sea mammals like seals and penguins. Dolphins often hunt together, herding fish into packed groups or into inlets where they can be easily caught. Some dolphins will share their food with the young or let the young catch injured prey as practice. They don't chew their food, they swallow it whole. Dolphins get the water they need from the animals they eat, rather than drinking ocean water. What do dolphins like to do? Dolphins communicate through chirps and whistles. Not a lot is known about their communication. They like to jump and play and do acrobatic spins in the air. They have been known to surf waves near the beach or follow the wake of ships. Dolphins are also very trainable as shown by the shows they put on at ocean parks like Sea World. How well can dolphins see and hear? Dolphins have excellent eyesight and hearing. Underwater they use echolocation. Echolocation is kind of like sonar where dolphins make a sound and then listen to the echo. Their hearing is so sensitive to these echoes that they can almost "see" objects in the water by hearing. This allows dolphins to locate food in cloudy or dark water. Dolphins have to sleep, so how do they do this without drowning? Dolphins let half of their brain sleep at a time. While one half sleeps the other half is enough awake to keep the dolphin from drowning. Dolphins may float at the surface while sleeping or swim slowly to the surface every now and then for a breath. Dolphins are part of the same animal order, Cetacea, as whales. Many dolphins are protected by the Marine Mammal Protection Act. The Hector's dolphin is classified as endangered. They are intelligent enough to understand complex commands. Like all mammals, dolphins give birth to live young and nurse them with milk. River dolphins live in fresh water, rather than salt water.